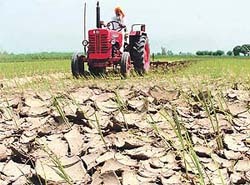 Untouched by the mild showers that lashed the region today, farmers of the Pakhowal-Raikot belt in the district continue to be resigned to their fate. The lush green cover that one witnesses in the countryside this time of the year is fast turning brown as the crops wilt for want of water. The state government has thrown a spanner in the wheel of the much-hyped admission to various distance education courses of the Punjab Technical University (PTU) by restraining the university from holding any fresh admission. Why were MC tenders worth Rs 30 lakh cancelled? The fact that the local Municipal Council, the nagar palika, has become a den of corruption, again came to the fore on July 12 here when tenders worth about Rs 30 lakh were cancelled under intriguing circumstances. Breaking his silence for the first time today, former minister and MLA from Ludhiana West, Mr Harnam Dass Johar, expressed shock and anguish over the plight of the detained employees of the Dayanand Medical College and Hospital (DMC). The faculty of Dayanand Medical College and Hospital has created a corpus fund out of voluntary contributions of each member to help DMCH employees. This would help homeless, jailed employees with clothes, food and other items of daily use. In a general body meeting at old DMC, the faculty deliberated over various measures to restore various aspects of the functioning of the hospital at the earliest, including issues of governance, the constitution of college council, teaching assignments etc. Are UP politicians giving shelter to accused? Connections with high-level political leaders in Uttar Pradesh, including members of Legislative Assembly and Council, are proving to be a saviour for at least seven persons accused in the three-month-old murderous attack on a senior union leader of the Railways outside his house near Jagraon bridge here. The Bhartiya Kisan Union (BKU) has expressed concern over the manner in which elections were recently held for the Delhi Sikh Gurudwara Management Committee, which it termed as a danger signal to the entire Sikh community. Punjab Municipal Workers Federation (INTUC) has hailed the decision of the Fiscal Management Committee of the Punjab Cabinet not to give effect unilaterally to the decision of freezing of dearness allowance, leave encashment and commutation of pension formula. The Punjab Bank Employees Federation (Ludhiana Unit) staged a day-long dharna here on Thursday in support of Bank of India Employees Union along with Bank of India employees to protest against actions of the management of Bank of India (BOI). If anything travels faster in modern world, it is the taste and the food habits which know no geographic or cultural or civilisational boundaries. That is why people relish the Mughal, the Chinese, the Italian or the European food as much as they like their traditional food. The Basti Jodhewal police has registered a case under Sections 392 and 460 of the IPC on the statement of Mr Ajit Singh, a resident of Gaunsgarh village, against six unknown assailants, who entered his house on the intervening night of July 16-17 and attacked his family to loot cash and household goods. In a special campaign to implement directions of the Punjab and Haryana High Court to paste reflectors on all slow-moving vehicles, more than 3,000 reflectors were fixed on vehicles last week. In preparation for the onset of rainy season, the Municipal Corporation has launched sanitation campaign under the supervision of the respective Zonal Commissioners in the city. The campaign, with special emphasis on improvement in sanitation level in public streets and roads, will continue till August 31.